The Shelter Logic canopy shelter will help protect your sports equipment and other items by providing a canopy roof over them. This canopy shelter measures 10 ft. x 10 ft. and is durable because of its four leg construction of sturdy beam welded steel that goes through a rigorous 13 step Rhino Shield preparation process and is bonded with a DuPont thermoset baked-on finish. Made with the patented Twist-Tite technology, the tensioning system is secure and taut ensuring a longer shelter life. 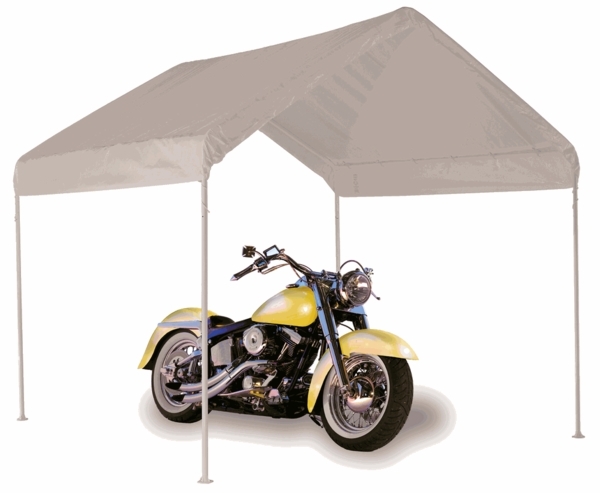 This canopy shelter also features wide-based foot pads that make it easy to secure, and the canopy itself is UV treated inside and out with fade blockers, anti-aging, and anti-fungal agents, and comes with a 10-year life expectancy. 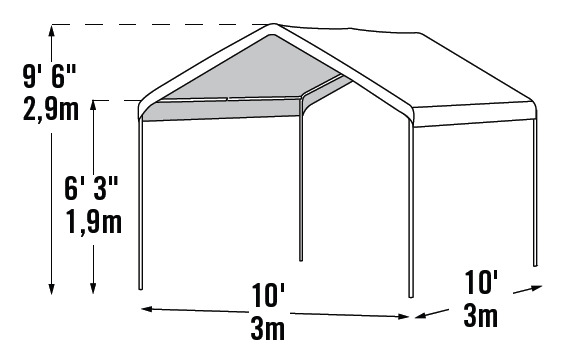 What is the height of this shelter? This shelter features a 6 foot, 3 inch valence height and a 9 foot, 6 inch peak height. I'm looking for a waterproof, high wind resistant 10x10 canopy that can be used outdoors for my two dogs to get under and out of the weather. Is this the tent you'd recommend? This model is appropriate and best suited to your needs. It involves simply assembly and has a polyethylene cover that is waterproof. How can I get a replacement cover for this model canopy? We do not sell the replacement cover for this particular shelter. Please contact ShelterLogic directly at 1-800-397-0192 for more information, referencing model number 23521. What colors are available in this style? The Shelter Logic Max AP only comes in white.